1969 - Marxists take power in south, rename state People's Democratic Republic of Yemen and reorient economy, society and foreign policy towards Soviet bloc. 1971 - Thousands flee to north following crackdown on dissidents. Armed groups formed in bid to overthrow government. 1972 - Border clashes between two Yemens, ceasefire brokered by Arab League. 1978 - Ali Abdallah Saleh becomes president of North Yemen. 1979 - Fresh fighting between two Yemens. Renewed efforts to unite the two states. 1990 May - Two Yemens united as Republic of Yemen with Mr Saleh as president, as Soviet bloc implodes. Tension between former states endures. 1992 - Food price riots in major towns. 1993 April - Coalition government formed, made up of ruling parties of former north and south. 1993 August - Vice-President Ali Salim al-Baid withdraws to Aden, alleging that south is being marginalised and southerners are being attacked by northerners. 1994 May - Saleh declares state of emergency and dismisses al-Baid and other southern government members following political deadlock and sporadic fighting. Former armies that failed to integrate square off on old border. 1994 May-July - Al-Baid declares independence of Democratic Republic of Yemen. 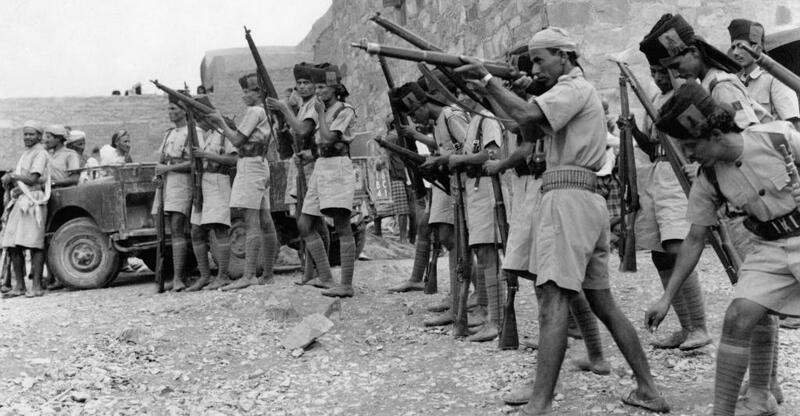 Northern forces capture Aden, southern leaders flee abroad and are sentenced to death in absentia. 2000 October - US naval vessel USS Cole damaged in al-Qaeda suicide attack in Aden. Seventeen US personnel killed. 2001 February - Violence in run-up to disputed municipal polls and referendum, which back extension to presidential term and powers. 2002 February - Yemen expels more than 100 foreign Islamic clerics in crackdown on al-Qaeda. 2002 October - Al-Qaeda attacks and badly damages oil super-tanker MV Limburg in Gulf of Aden,killing one and injuring 12 crew members and costing Yemen dear in lost port revenues. 2003 April - The 10 chief suspects in the bombing of the USS Cole escape from custody in Aden. Two are re-captured in 2004. 2004 June-August –President Saleh send troops to Saada to quell what he calls an insurrection. Sheikh Hussein Badreddin al-Houthi calls on Sana’a to end persecution of Zaidi Muslims in the highlands, and warns against debilitating influence of Wahhabi clergy in Northern Yemen. 2004 September - Government says its forces have killed Sheikh Hussein al-Houthi. 2005 March-April - More than 200 people are killed in a resurgence of fighting between government forces and supporters of the slain cleric and tribal leader Sheikh Hussein al-Houthi. 2005 May - President Saleh says the leader of the rebellion in the north has agreed to renounce the campaign in return for a pardon. Minor clashes continue. 2005 July - Police and witnesses say at least 36 people are killed across the country in clashes between police and demonstrators protesting about a cut in fuel subsidies. 2006 March - More than 600 followers of slain Sheikh Hussein al-Houthi who were captured in 2004 are released under an amnesty. 2006 September - President Saleh wins another term in elections. 2007 January-March - Scores are killed or wounded in clashes between security forces and Houthi militants in the north. 2007 June – Sheikh Abdel-Malik al-Houthi accepts a ceasefire. 2007 July - Suicide bomber attacks a tourist convoy killing eight Spaniards and two Yemenis in the province of Marib. 2008 January - Renewed clashes between security forces and rebels loyal to Sheikh Abdul-Malik al-Houthi. 1992 December - Bombers hit hotel in Aden formerly used by US marines - first known al-Qaeda attack in Yemen. 2000 October - Suicide attack on destroyer USS Cole in Aden. 2002 October - French tanker Limburg (pictured) damaged by bomb-laden boat. 2007 July - 8 Spanish tourists, 2 local drivers killed by car bomb. 2008 September - 16 killed in car bombings outside US embassy. 2009 January - Saudi, Yemeni al-Qaeda branches merge to form al-Qaeda in the Arabian Peninsula (AQAP). 2009 August - AQAP bomber dies in failed bid to kill Saudi deputy interior minister. 2009 December - 'Underwear bomber' Umar Farouk Abdulmutallab tries to down US airliner in plot claimed by AQAP. 2010 October - Parcel bombs, thought to have been made by al-Qaeda and dispatched in Yemen, found on US-bound cargo planes. 2011 May - AQAP fighters take control of southern city of Zinjibar. 2011 September - Al-Qaeda-linked, US-born cleric Anwar al-Awlaki killed in US air raid. 2012 February - Suicide attack on presidential palace kills 26 Republican Guards on day that President Hadi is sworn in. AQAP claims responsibility. 2012 May - 96 soldiers are killed by suicide bomber in Sanaa. AQAP claims the attack. 2012 June - Army retakes Zinjibar from AQAP after month-long offensive. 2008 March-April - Series of bomb attacks on police, official, diplomatic, foreign business and tourism targets. US embassy evacuates all non-essential personnel. 2008 September - Attack on US embassy in Yemeni capital Sana'a kills 18 people, including six assailants. Six suspects arrested. 2008 October - President Saleh announces arrest of suspected Islamist militants allegedly linked to Israeli intelligence. 2008 November - Police fire warning shots at Common Forum opposition rally in Sanaa. Demonstrators demand electoral reform and fresh polls. At least five protesters and two police officers injured. 2009 February - Government announces release of 176 al-Qaeda suspects on condition of good behaviour. 2009 August - The Yemeni army launches a fresh offensive against the Houthis in the northern Sa’ada province. Tens of thousands of people are displaced by the fighting. 2009 November - Saudi Arabia says it has regained control of territory seized by Yemeni rebels in a cross-border incursion. 2009 December - Yemen-based branch of al-Qaeda claims it was behind failed attack on US airliner. The government calls on the West for more support to help it combat the al-Qaeda threat. 2010 February - Government signs ceasefire with Houthi rebels, which breaks down in December. 2010 September - Thousands flee government offensive against separatists in southern Shabwa province. 2010 October - Global terror alert after packages containing explosives originating in Yemen are intercepted on cargo planes bound for the US. 2011 January - Tunisian street protests encourage similar demonstrations in other countries, including Yemen. President Saleh pledges not to extend his presidency in 2013 or to hand over to his son. 2011 June - After months of mounting protests, President Saleh is injured in rocket attack and flown to Saudi Arabia, returning home in September. 2011 September - US-born al-Qaeda leader Anwar al-Awlaki is assassinated by US forces. 2011 November - President Saleh agrees to hand over power to his deputy, AbdoRabbo Mansour Hadi. Unity government including prime minister from opposition formed. 2012 February - Hadiis inaugurated as president in a one-man election. 2014 January - National Dialogue Conference winds up after ten months of deliberation, agreeing a document on which the new constitution will be based. 2014 February - Presidential panel gives approval for Yemen to become a federation of six regions as part of its political transition against popular wishes. 2014 July - Tribesmen blow up the country's largest oil pipeline, disrupting supplies from the interior to a Red Sea export terminal. 2014 August - President Hadi sacks his cabinet and overturns a controversial fuel price rise following two weeks of anti-government protests in which Houthi rebels are heavily involved. 2014 September - Houthi rebels arrive in the capital calling for President Hadi to abide by the terms of the National Dialogue. Hadi surrenders the capital to the Houthis when he orders all military and security forces to stand down. A comprehensive dialogue begins. 2015 January - Houthis reject draft constitution proposed by government. 2015 February - Houthis appoint presidential council to replace now resigned President Hadi. Hadiflees to Aden southern stronghold. 2015 March - Islamic State carries out its first major attacks in Yemen - two suicide bombings targeting. March 25, 2015 - Saudi-led coalition of Persian Arab states launches air strikes against Houthi targets and imposes naval blockade. 2015 September - President Hadi returns briefly to Aden after Saudi-backed government forces recapture the port city from Houthi forces and launch advance on Aden.